It's hard to remember all the nice parts of a trip when it's bookended by Ryanair flights and extremely backed up German border crossings, but setting that aside, I had a wonderful time in Sofia this weekend. After months of incompatible schedules, my friend Owen (yes, really) and I finally found somewhere we could meet, with him coming from Düsseldorf and me from Berlin. I did not know a lot, or really anything about Sofia. I still don't. I remember from elementary school that the capital of Bulgaria had a nice and easy-to-remember name. I've met some Bulgarians at different points in my life, but I would be hard-pressed to recall anything about country or people. Are there any famous fictional Bulgarians? In fact, a new friend in Berlin is Bulgarian but I didn't realize it until I ran into him at a party a week before the trip. So suffice it to say, I went in pretty blind. I don't think Sofia sticks out as having particularly beautiful or interesting architecture or urban design. There do seem to be large number of parks and public spaces, though in winter everything's covered in snow and ice anyway. Buildings tend to look (to my untrained eye) basically socialist blocks or 70s concrete. What's actually the difference? There are two subway lines, one which goes to the airport, so points for convenience, especially compared to Berlin. There are lots of buses and trams, but I couldn't figure out how to use them and we mostly walked places anyway. Someone should make an app with a trip planner for Sofia! This was one area where Sofia really surprised me. We got a few tips for restaurants to check out and even went on a free food tour. Almost everything we ate was really good! It was interesting, experimental, well-cooked. 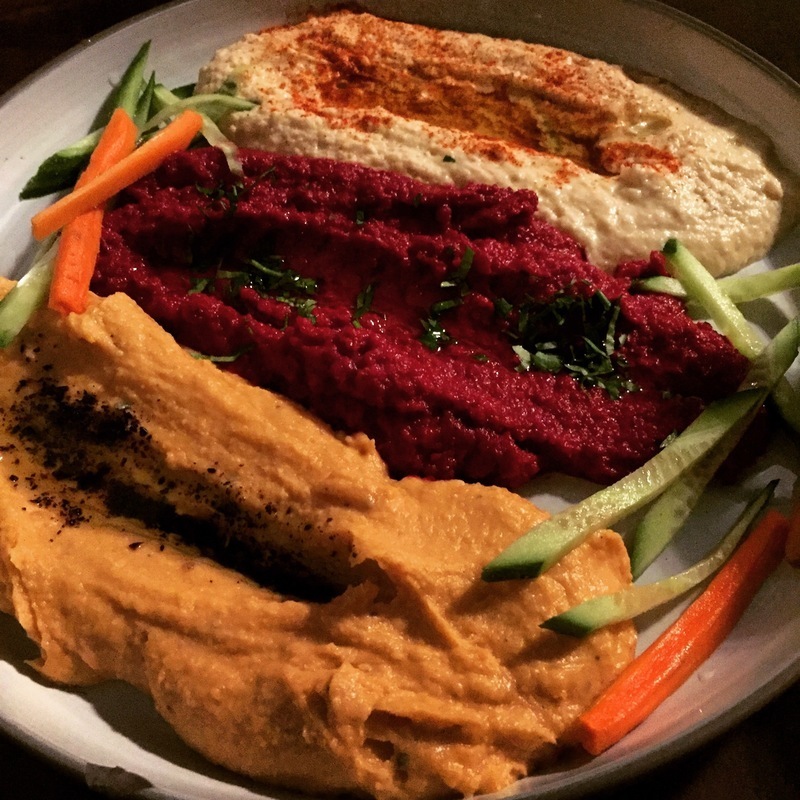 I didn't expect there to be a forward-thinking food scene, but there was and we were lucky enough to experience a bit of it! 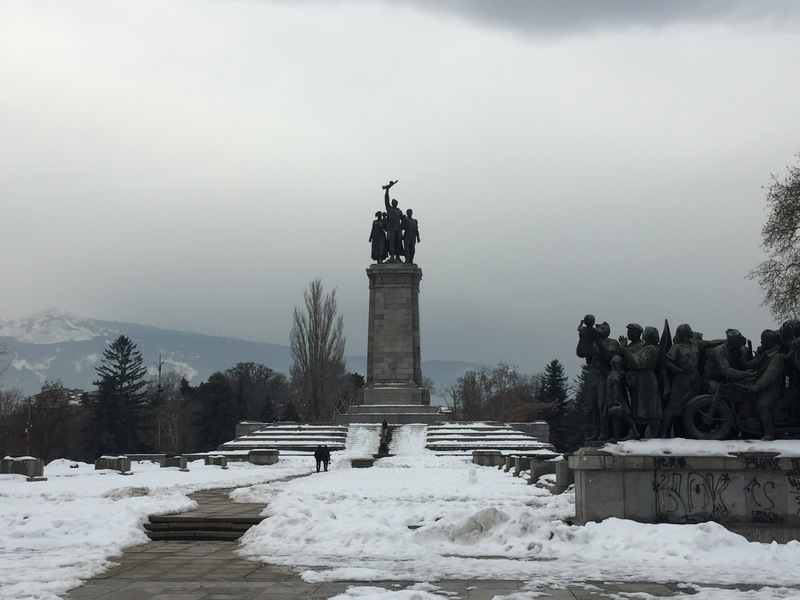 My final thoughts on Sofia and Bulgaria are that I'd like to understand their history better. While on the walking tours, our guides tended to gloss over the thousands of years of history, explaining that there were Thracians, then Slavs and proto-Bulgarians who came to occupy the land that is now Bulgaria. I'm sure it was bloodier and messier, and a country that has 3 kingdoms and was conquered by the Ottoman empire surely has a complex history. But I always feel this way after I go on trips, so please recommend any good (interesting) histories of Bulgaria that you might have! Even fairytales would be an interesting place to start. I've been told that it's high time I wrote an update. Short on details, but baby steps, right? Istanbul Airport, in what feels like the largest airport lounge in the hemisphere. A little over a week ago, I made a new friend who was very excited about going to take a look at some crop circles nearby. I don't think about outer space aliens very much, but I love seeing new things, and I've been meaning to get out of Berlin more often. What better way to start than to take the regional rail (S-Bahn) almost to the very end of the line? Our motley crew assembled at S-Bahn Lichtenrade, which is not quite the southern end of the S2 line. 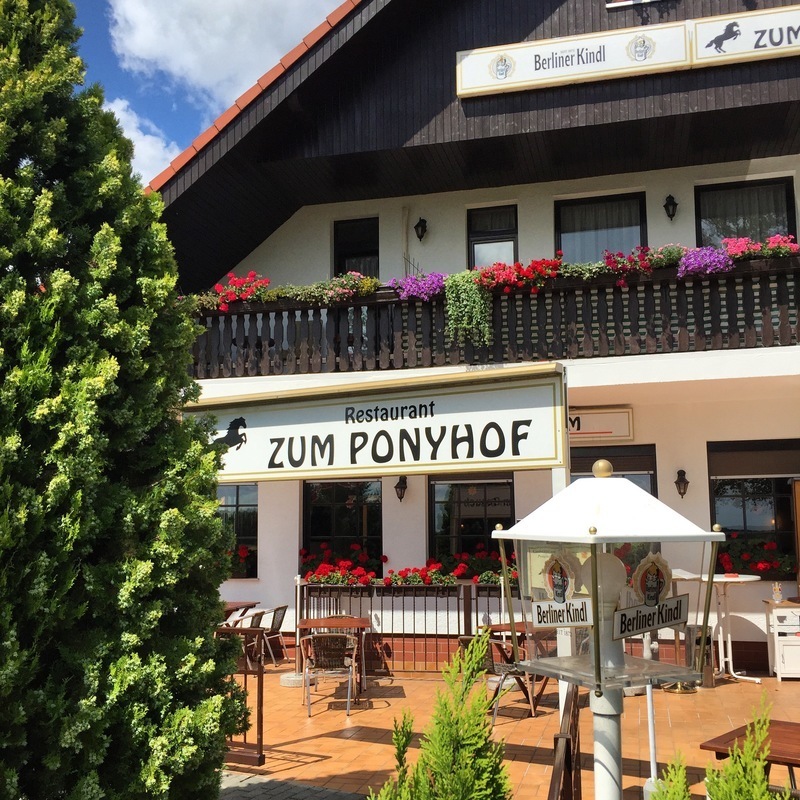 We took a bus (I can't figure out the exact number, which is a testament to Berlin's suburban transit system) and then started walking along the side of road, passing by "Zum Ponyhof" which I hoped we would be able to stop by on the way back for a nice, cold beer. But alas, das Leben ist kein Ponyhof and we never saw it again. 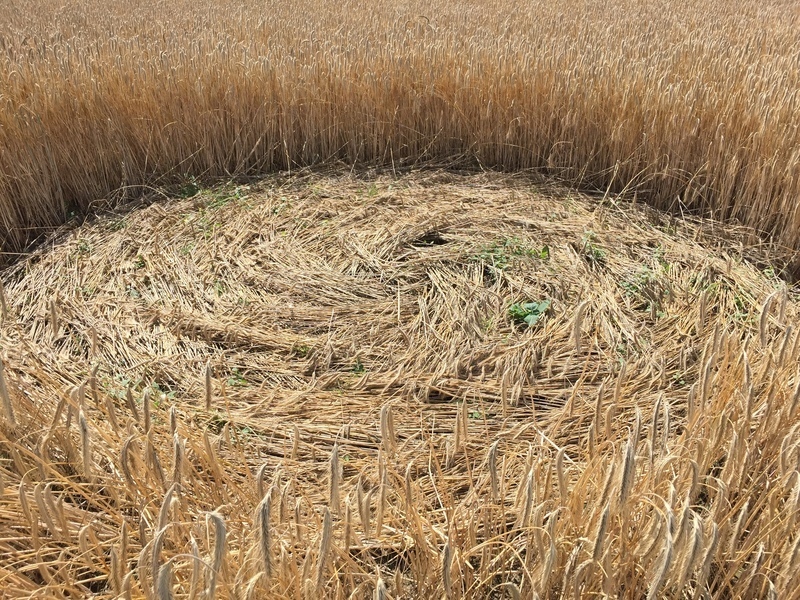 Instead, we neared our first crop circle. Did I mention it was an incredibly beautiful day to be out in the Brandenburg farmland? The sky was blue and full of fluffy white clouds, there was a gentle breeze to cool our (my) sweaty urban brows. We wandered around the first circle. I thought it was pretty amazing how evenly the wheat was pressed down, sometimes in quite pretty patterns. Whatever you think of crop circles and the mystery surrounding them, I realized I liked them most because they're in the middle of a wheat field. 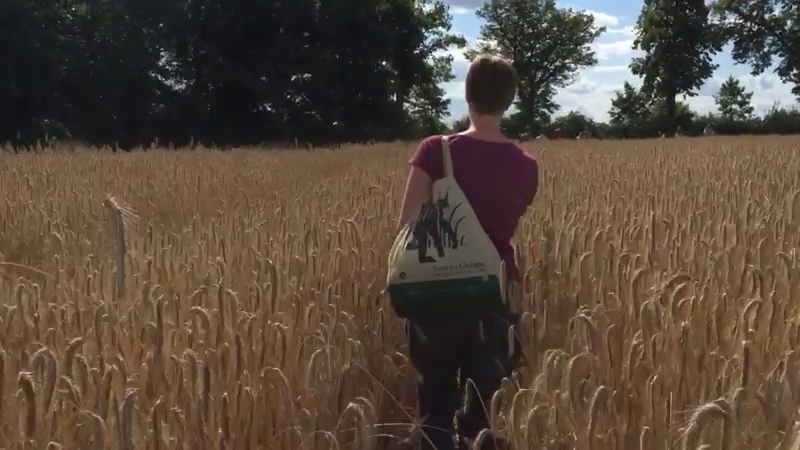 There's something about being confronted by a huge swath of golden grain as high as my shoulder, and walking down a tiny little path that leads to a beautiful pattern of flattened wheat. The second one was much smaller, but we stuck around and had a little picnic before walking back to civilization. Human civilization, that is. For someone who lives (and makes a living) on the Internet, I've been surprisingly delinquent in posting here regularly. Months ago, I started collecting topics on Wunderlist that I want to write up. Instead of actually getting them out there, the list just keeps getting longer! In lieu of all those, here's a not-so-brief update on what's going on with me. The biggest news first (and probably pretty obvious): I got my visa to stay in Berlin: a freelance work permit! In the middle of January I moved into an apartment in Kreuzberg, not too far from Cocolo, one of my favorite ramen places in Berlin, and coincidentally down the street from Feli, a San Francisco, Hamburg, and now Berlin friend. 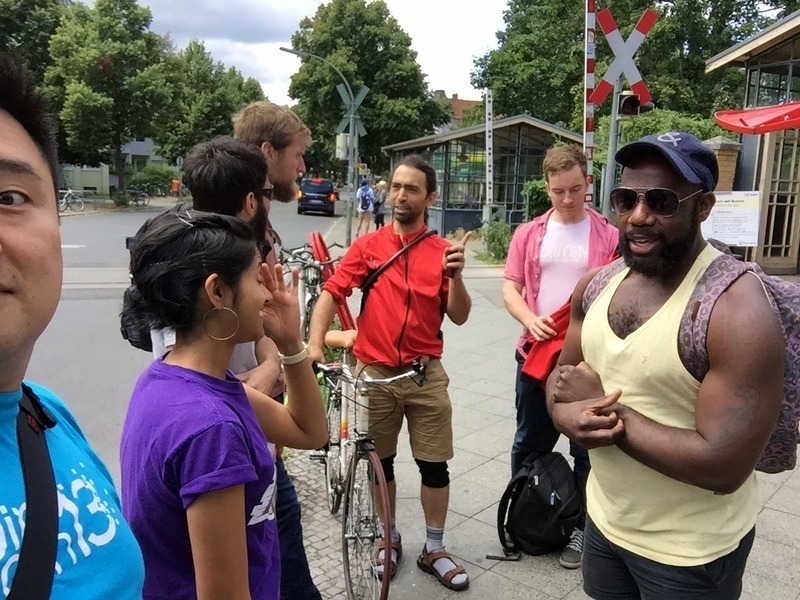 My friend David and I are thinking about finding a place together though not in a rush, so if you happen to hear of any great 3-4 room apartments with a balcony in Berlin with good transit connections, keep us in mind! The good folks at Democrats Abroad Berlin elected me to the board, where I'm serving as the Communications and Media Coordinator. I'm really looking forward to planning working together with the new board and getting some of our ideas off the ground to engage Americans and people interested in U.S. politics over the next two years. If that sounds like fun to you, drop me a line. Finally, I've been tossing around the idea of starting a podcast (in English) about being all the exciting things going on in Berlin. Since it's about stuff that I like, it'll probably be a mix of cultural stuff, events, tech, and miscellanea. Suggestions, advice, ideas, and offers to come on the as-yet-undebuted show are welcome. Through a lucky confluence of events, I started off the year with an exciting project: organizing a trip in March to San Francisco and Seattle for a group of German media folks (editors and publishers). I got to work with Ulrike Langer and Annette Milz (Chefrunde, Medium Magazin), and we put together an eye-opening set of technology and media companies, focusing not only what they're changing/disrupting but also how they're doing it. I just signed on for the New York version of the trip at the end of June / early July, so I welcome any suggestions for and introductions to New York-based startups. I've also been working on a project for a documentary film, The Forecaster. We're putting together a crossmedia website to accompany the film, which covers a lot of historical and financial topics. I'm working on pulling together the editorial content and links to resources for people who want to know more about things like the Nikkei crash in 1990 or the role currency played in the fall of Rome, or even what caused the housing crisis (though Planet Money has done that better than just about anyone). What's especially fun has been just being introduced to various startups in Berlin and getting to know the cool things that people are working on. They deserve their own blog posts, but most recently: Kitchen Stories (thanks Verena! ), TestCloud (run by another SFer in exile, Frederik), and Resmio (I owe Yasha a coffee). In December, I flew to Michigan and spent Christmas with my family there, which in addition to being a much needed visit, was calculated to put me right over the threshhold for United Premier Gold. If you didn't know that about me, I am a little obsessive about frequent flyer programs and collecting miles. So far all I've gotten out of it is picking Economy Plus seats early on United flights and some time in a lounge in Newark. One of my reasons for moving to Europe was to travel more and to do it spontaneously. That's how I ended up deciding a week or two before Mobile World Congress and 4 Years From Now to go to Barcelona. Many thanks to the friends who convinced me that it would be really fun and not stressful (Hendric, Feli, Malte) and to GfK for the extra conference pass. With just a weekend back in Berlin, I flew off to San Francisco for about two weeks the above trip and also to catch up with all the friends and folks I didn't really say goodbye to when I left a year ago on my sabbatical (which then turned into staying in Berlin forever). I also took the time to clean out my old room in the Mission, which was the last big thing tying me to the city. Surprisingly, despite how striking San Francisco is, gorgeous views like this made me happy to be there, but not heartsick for what is probably one of the most beautiful places I have ever lived. Seattle was a great way to round out my West coast return, I hadn't been there since I lived in Portland and my parents took us on a trip through the Pacific Northwest. For the next few months, I'm planning on mostly staying put and enjoying the summer in Berlin, though I'll be in New York (and Philadelphia), and there's a part of me that wants to take a last minute trip to Pioneers Festival in Vienna. My friend Mark is on a northern European vacation, and he came down to Berlin with his mom for a day trip. Of course, they wanted to see all the main sites of the city like Checkpoint Charlie, the Brandenburg Gate and the Berlin Wall (don't worry, we also went to Gendarmenmarkt, Potsdamer Platz, and the Holocaust Memorial). To keep it interesting for myself, we ended up taking a different route, which took us past the [de] Trabi Museum (iconic East German car), the building formerly known as [de] Markthalle III, and the Topography of Terror documentation center. 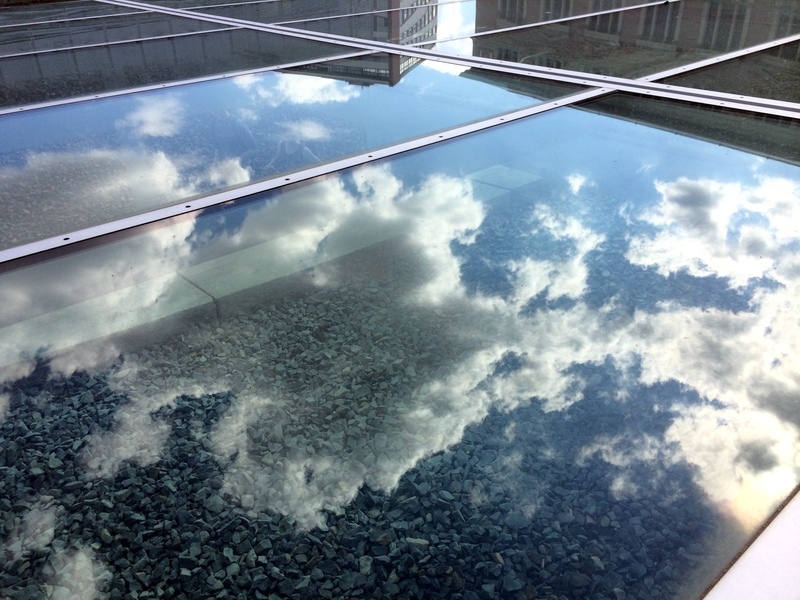 At that last place, I caught myself taking this picture, which while pretty, has no redeeming qualities except that you can see the clouds and the gravel at the same time. When my friend Melissa visited two weekends ago, we went up to the dome on top of the Reichstag building which houses the German parliament. I'd recommend to any Berlin visitors with the time, but it's easiest if you register for free visitor tickets or make reservations at the restaurant in advance. 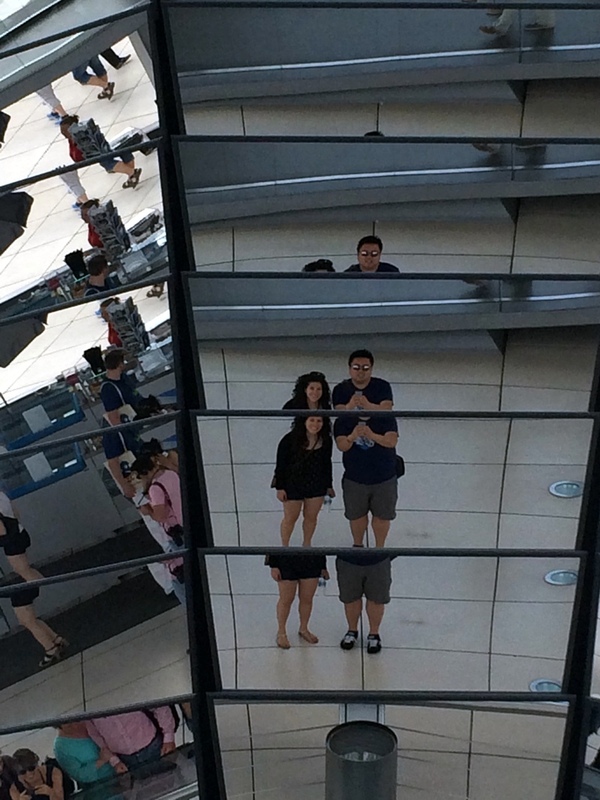 It's a great place for amazing views of central Berlin, also full of glass and mirrors... lots of fun reflections. I dug a little deeper in my photo archives, and found several more from this year.